Mona's daughter gave us the word this week and she's writing her own story so check it out! I think they're mighty fine! This next one can be used as a clapping game or you can get out the skipping ropes! You can make up a simple tune to this using basic guitar chords like D, G,A, C and F. Perhaps some kids could make their own tunes to these words. This works well in Gr. 2/3. I'd also hand out some rhythm instruments and teach them the Beat of the song (the underlying pulse) and then I'd show them how the Rhythm (tapping to each syllable of a word)was different from the Beat. Cookies on the cookie sheets. And use a cookie cutter. So make me some soon! Naturally, you start by brainstorming ideas and then progress to printing out lines on huge chart paper. You colour code rhyming words and mark the beat with accent marks above the parts of words. The kids would practise this every day until they know it, before you start making up clapping games and using instruments. It's a great multi-purpose lesson which integrates many skills; reading, writing, spelling, language (syllables) singing, elements of music, movement, participation and group/partner skills. Wow! This is all bringing it back to me what I've done for the past 27 years! Mother of Invention, missing teaching music just a little bit! Wonderful entry. I love it. This is really great. Stimulates the students fantasy in an intelligent manner. And they will never forget. I wish I had had a great music teacher like you. This sounds like an amazing and fun way to teach music to young kids. I "tagged" you today (or whatever the right blog terminology is). It is great when you make up songs with kids - and they are good ideas to make it useful educationally too! (taking notes in jam-packed cheeseholey brain to try this). Your cookie photos are making me drool! And I will have that song in my head all day long! Now I want some cookies! What a fun "batch" of lessons for the kids. Lay offa my lorna Doones"
Toraa: Thanks! Stimulates my fantasy too...of eating all the cookies I want and not gaining any weight!! David: Thanks! I did try to make it fun and the best part of the younger kids is that they buy into anything you do...Gr.8's? No thanks! Topchamp: You are so musical I imagine you could do tons of stuff like this. Kids also love songs when they get to fill in a word they make up or a song that you choose their names to be in. It gives them ownership and connection...and sometimes it's just plain and silly fun! Mona: You know that tune? I thought you'd be too young! I love your daughter's entry! Brooksba: Ah, that's a good one! Thanks! Steve: Aw man, I want YOU in my class! You must remember this ad: "Fly to the moon for Lorna Doone!" What the heck were those cookies like? Fig Newtons? I forget! Music was my favorite class in school. Our Mrs. Hendrix never did anything as creative as you, but it was still fun and a nice escape from the drudgery of learning the multiplication tables and grammar rules. Did you serve cookies when you sang about them? Did you sing about veggies too? Barbara: I loved my Gr. 4 and my Gr. 7 music teachers! They turned me on to music. Yep, we did used to make cookies as a follow-up, but now you can't make any peanut butter cookies in schol because of allergies. At Thanksgiving and Harvest, we did a vegetable soup song and had a veggie tasting session and made Stone Soup! Old Lady: Ya gotta come to class and sing the song! Diana: We'll be doing a chocolate theme at Easter! 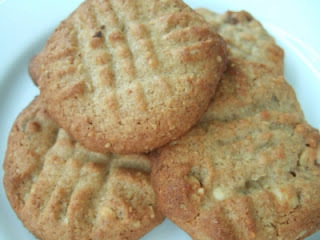 Lynclay: Peanut Butter cookies' tell-tale sign, the fork press! Home made are so much better than store-bought! You just gave me some great ideas! I can definitely rework some ofthose things to gear towards Kindergarten kids. Thanks! you brought back wonderful memories of my own music teacher, Mrs. Bartholf. She was the single largest influence on my young life, educationally and beyond. She taught me so much more than music, just an amazing woman, a true gentle spirit. I have never forgotten her. 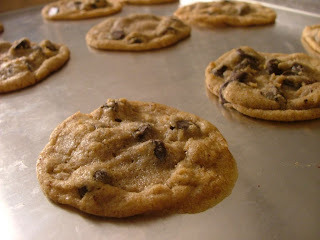 Also, I'm heading to the kitchen, gotta make some cookies! Hmmm chocolate chip cookies! And since I've got my lovely American wife in my life, I've been fortuned to have them home made. Your poem takes the taste to a new dimension - like I've said before: Wish I had a teacher like you! That's made my mouth water! I can so imagine you working out the song, then running it to production, MOI - the teaching world must miss you horribly... and all the kids that haven't got you for a teacher!! Now, must remember to get some cookie ingredients tomorrow! Wish you had been my teacher. Abigail: Great to have a reader who can and will actually use these ideas! Good Luck! Rapunzel:That is so neat that she was that much of an influence. I hope you tell her that some day! Renny: Thanks so much for your kind words! You are spoiled more than my husband with all Diane's home cookin'! Annelisa: Thanks! I am told that the kids miss me and every Thurs. when I go to help, some ask me when I'm coming back to do music. I should really prcrice the guitar and go over for a few sing-songs. Gr: AW! You get to move into the front seat on the carpet and I'm giving you EXTRA cookies for snack time!! !